Greenville, SC, positions itself unassumingly in the northwestern corner of South Carolina. With a municipal population of over 60,000 residents, Greenville has become nationally ranked as not only one of the Top 10 fastest growing economies in the United States but also the 13th Best City for Young Professionals and boasts the 3rd Strongest Job Market in the United States as well. As the seat of Greenville County, the city proper commands 26.1 square miles and is the sixth largest population in the state. Typically, sustainability is thought of as being a predominantly large-scale urban concept. Several cities around the country such as Los Angeles, New York, and Chicago all boast multifaceted initiatives. Greenville has chosen to lead the charge in South Carolina with initiatives of urban revitalization, public transportation using clean energy and has appointed a sustainability commission to look after these programs. The City of Greenville has embraced sustainability in numerous ways and is actively engaged in initiatives to make the city a more sustainable place to live and work. In 2006, Mayor Knox White signed the U.S. Mayor’s Climate Protection Agreement and the U.S. Green Building Council, both of which are organizations that promote green building and sustainability. The U.S. Mayor’s Climate Protection Agreement has been signed by over 500 mayors urging the Federal Government to reduce emissions and to fund urban renewal projects originally set forth by the Kyoto Protocol. These organizations provide information and technical support that has aided the City in the completion of a Greenhouse Gas Inventory and other projects. Several organizations in the Greenville area are part of the sustainability movement. Many educational institutions such as Furman University, Clemson University, The University of South Carolina, and Greenville Technical College all promote a sustainable lifestyle and offer curricula that feature green initiatives. Furman University, for one, boasts an impressive program. The university has replaced all of its old heat pumps in their dormitories with more efficient geothermal ground-source pumps which take advantage of the constant temperature of the earth. The roof of their physical activities center sits atop a LEED silver-certified building and generates its own hot water system. Perhaps the most innovative is the energy dashboard which allows Furman University community members to view real-time energy usage on a website. Greenville Technical College (GTC) also offers a sustainability curriculum. Greenville’s Reedy River has always served as a landmark in downtown. Providing summer events, kayaking, walking paths and charity rubber duck races, the river is a proud landmark for all citizens. Several decades ago the Reedy River became polluted and major downtown revitalization projects have recently attracted tourists and locals alike. Along with cleaning up the Reedy River, GTC employs two professors that were recognized for their programs at the League for Innovation’s Innovation of the Year 2011 Awards. These numbers are justifiably astounding. When compared with Schaumburg, Illinois (a comparable reference point for Chicagoans), Greenville has some significant work to do. Schaumburg has only encountered 282 spills and 607 Environmental Permits, all while not facing any illegal drug labs and zero landfills, according to the report. With all of the initiatives that Greenville has in place, there are still several challenges that the city itself faces. Just how is Greenville combating these low scores? In addition to several educational institutions involved in sustainability, the city has received funding from the Department of Energy’s ‘Energy Efficiency and Conservation Block Grant’ (EECBG) Program. Greenville spent most of its $743,400 EECBG award using $713,400 for energy efficiency upgrades to the Carolina First Center, an existing City-owned building that is the largest convention and meeting facility between Atlanta and Washington, DC. The City replaced 14 heating, ventilation, and air conditioning (HVAC) rooftop units at the Center with six energy-efficient rooftop air handling units. The project created 14 new jobs and will save the City more than $11,000 per year, since the new units consume 20 percent less energy. Greenville will spend the remaining $30,000 of its funds to conduct a greenhouse gas emissions inventory which will help the City identify new opportunities to save energy and reduce emissions. Along with the Carolina First Center, TD Ameritrade awarded Greenville a “TD Green Streets” grant. This grant commits a minimum of $20,000 to urban forestry in the downtown area revitalization projects. The grant also funds projects of urban forestry in underserved communities, including the planting of trees, maintenance costs and education in sustainable living. Along with the major initiatives done by institutions such as the Carolina First Center and TD Ameritrade, Greenville has involved students at area schools in the sustainability effort. Students at the A.J. Whittenberg Elementary School collected over 2,000 plastic bottles and built a greenhouse. The greenhouse, which sits on school grounds, serves as part of the school’s organic garden and composting facility. The greenhouse project was part of a Champions of the Environment grant from the state Department of Health and Environmental Control and was directed by the city’s “livability educator”, Jaclin DuRant. In the same neighborhood, just down the road from Whittenberg Elementary School, the city of Greenville is planning on moving Public Works Operations to a new prospective site due to the fact that their current site is in a flood zone. While this normally would seem like a predominantly municipal government type of issue, the city has chosen to host several meetings for the public to not only voice their concerns and opinions but also to include the residents in the design of the park itself. The relocation would provide an opportunity to develop a public park and a safe place for the Reedy River to temporarily flood. According to Parks and Recreation Director Dana Souza, “the trees, shrubs, grass and open space with the park and the flood zone would easily tolerate the effects of a flood, and the open land would more closely reflect the natural function of a floodplain” (Connections for Sustainability). More importantly, I believe that the connection West Side residents to the Swamp Rabbit Trail and to downtown Greenville would be the more beneficial outcome. The West Side of Greenville, until very recently, was the lower income, dilapidated side of town. Renovations over the past ten years have revitalized this neighborhood with a new baseball stadium and over 100 independent restaurants in a ten block radius. With the high number of restaurants downtown and the stigma of fried foods in the south, one cannot discuss sustainability without talking about or at least giving a nod to organic farming. 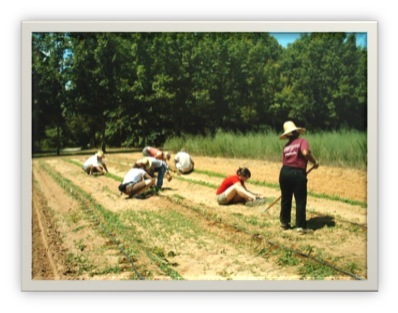 The Greenville Organic Foods Organization, founded in 2006, serves to introduce people of Greenville to the positive effects of organic farming, where food comes from and how it is produced and how to eat a healthier lifestyle. There is not just one community farm in Greenville so many families are able to participate in this effort throughout the city and county. The main community garden is located in the heart of the city, near the downtown area and is limited to fourteen families. Several times per year there are workshops so that other residents may learn how to grow their own food and start their own gardens and cooking classes are offered as well. Greenville, South Carolina, still faces several sustainability issues but major initiatives taken by the current mayor, Knox White, have helped to push Greenville in a more sustainable direction. The city and county have become major hubs for industry over the past two decades and the population continues to thrive. Because Greenville plays host to so many major industrial corporations and several educational institutions, the progressive population of Greenville supports sustainability on a level that would not commonly be associated with a mid-sized southern city.